Your body is comprised of around 206 bones. Unless you broke one of them at some point in your life, you probably don’t give much thought to any of them. But bone physiology is important for any trainer or hard-training athlete to understand, so I’m going to cover the basics of what you need to know. First off, bone isn’t a passive tissue that just maintains your uprightness and holds your soft tissues in place. Nope, bone is a living, adaptable tissue that’s classified as an organ. It can grow, repair and remodel, much like muscle tissue. Growth: bone starts off as hyaline cartilage and then ossifies to give it that hard structure adults carry around. Repair: as you know, when a bone breaks it doesn’t stay broken. The bone can repair big damage (i.e., fracture) and it can also repair micro damage that occurs on a daily basis. You don’t feel micro damage but it occurs each time you lift heavy weights or land from a jump. However, you will feel micro damage if it accumulates faster than the bone can repair itself, thus causing a stress fracture. The only treatment for a stress fracture is rest so you can let the skeleton system put the deposition/resorption ratio back in balance. Remodel: cells in bones feel tension and respond by either laying down new bone (deposition) or removing bone (resorption) when the compressive forces halt for an extended timeframe. Importantly, remodeling is not just growth. Patients with paralysis experience high levels of remodeling through resorption. Remodeling and resorption are constantly occurring throughout life. Whether that remodeling results in more or less bone depends on the ratio between the two. Your bones consist of spongy bone on the inside, and a hard covering of compact bone on the outside. As mentioned, bone is a living tissue that receives blood from arteries and vessels that supply nutrients to keep it strong or make it smaller through resorption (deloading) or repair damage. There are three types of cells within bone: osteoblasts, osteoclasts and osteocytes. Osteoblasts lay down new bone either after a fracture or when the bone is stressed through load bearing and weight training. Osteoclasts do the opposite since they chew up bone either after a fracture to remove the damaged tissue, or when you unload the skeleton system. Astronauts have to deal with the ramifications of increased osteoclasts (resorption) activity when they’re in space. Osteocytes help maintain the bone integrity and can deposit or reabsorb bone based on the demand you give the skeletal system. Osteoblasts eventually become osteocytes. The most obvious answer is an extended period of time when your skeletal system isn’t receiving compressive forces. I’ve already mentioned astronauts since they’re the most extreme example, but you could also lose bone density by being bedridden for an extended period of time. You might also lose bone if you dropped weight training from your exercise plan and started swimming instead. Nutritionally speaking, a diet low in protein, vitamin C, calcium or vitamin D can all weaken the bones so it’s important to get enough of each. Osteoporosis occurs when resorption outweighs deposition. Most older people experience some level of bone loss due to decreased load-bearing activity and a change in hormones (estrogen and parathyroid). Will weight training stunt a child’s growth? “There’s absolutely no research that shows weight training will stunt a child’s growth,” was the reply my bone professor at USC gave me when I asked him that question. It’s easy to think that weight training or gymnastics might keep kids short since most of the great ones are anything but tall. However, the reason you see so many short athletes in those sports (at the Olympic level) is because being small helps them excel at their sport. In other words, the young athletes that grew tall didn’t make the cut. How much can I increase the diameter of my bones? The research demonstrates that load-bearing exercise (think: heavy deadlift) can increase your bone mass 1% per year. Sure, that’s not much but the real factor is that you’re not losing bone: that’s what really matters. It’s important to add as much bone mass as possible before you turn 40 because it’s much more difficult to catch up later in life. Although, it’s never too late to start laying down new bone with load-bearing exercises. Yep, you just might need to show grandpa how to deadlift! Great article, Chad! This is often overlooked. When our mom’s start going through menopause, the first thing we can recommend is resistance training. 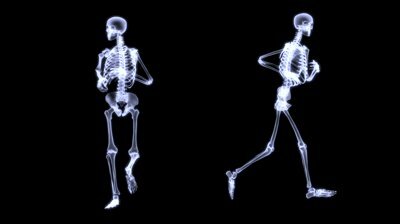 Now, this notion that load-bearing exercise can increase bone mass: does it apply to bodyweight training routines? Or only weightlifting? In other words, is it the tension in the muscles that can maintain and improve bone mass, or is it the stress of literally lifting something heavy? CW: Heavy lifting (>80% of 1RM) would likely benefit someone’s bones the most. However, even BW exercises might help. I suggest a combination of the two.